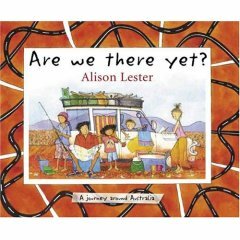 For this class we were aksed to bring in 3 children's book for show and tell. 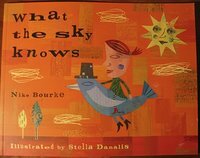 I took What the sky knows written by Nike Bourke, illustrated by Stella Danalis. I just got this book a few weeks ago and fell in love with it. It is so whimsical and free. It's done with collage of painted pieces of paper for the background and other tasty treats in the foreground. 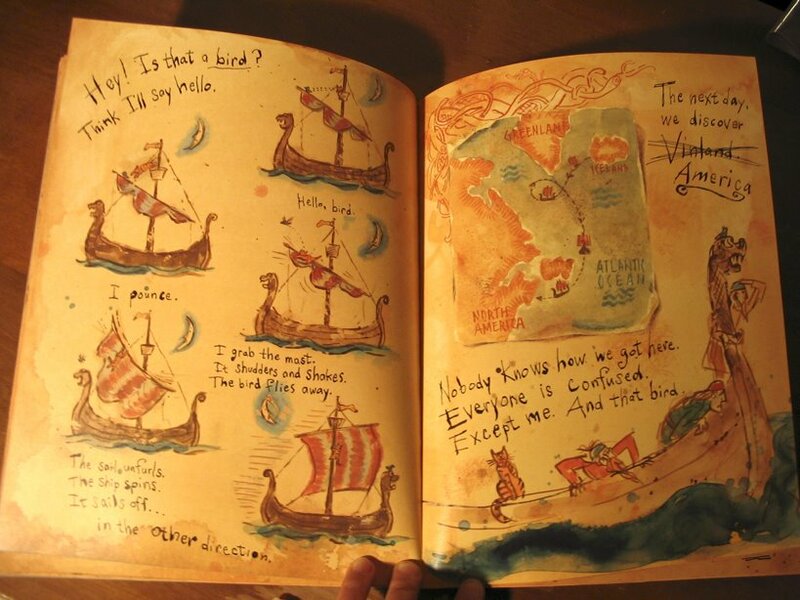 The story is beautiful too and very simple. 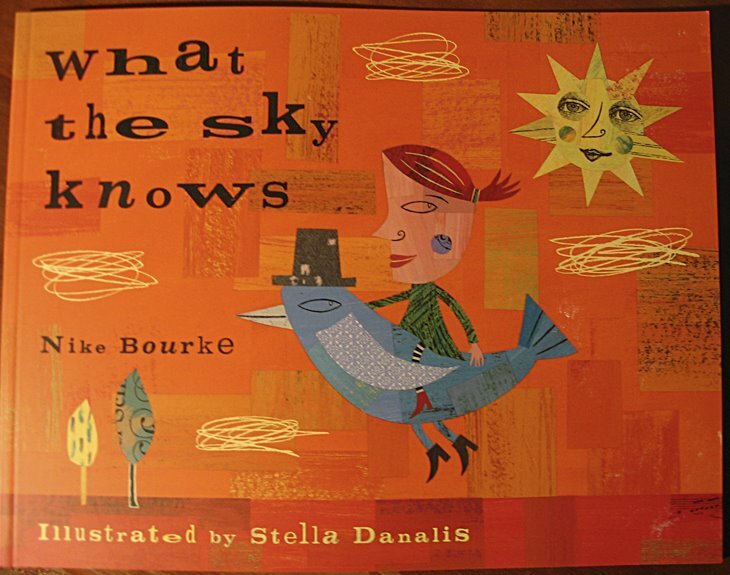 Very few words to a spread (sometimes only two or three) and it is all about what we can learn from the sky: how to be blue; or pink; or carry birds; or make leaves dance. It has really made me think about how to illustrate something in a non-literal way. Very inspiring. 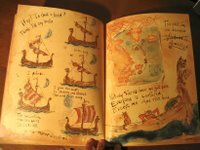 I like this one because it is in the format of a journal and the illos are extremely loose, almost messy, but in a perfectly gorgeous way. 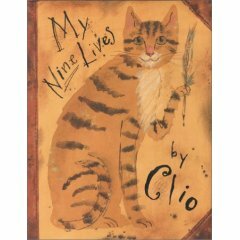 It is basically the story of a cat (written by the cat) of its 9 lives throughout different eras and how he effected change in all those times (for instance, inventing the fork, the clock or discovering jazz!) It is full of humour and fun, is very expressive, and has this great parchment look all the way through. One thing Lorette remarked on with my books was that they are all orange. I thought that was quite interesting - totally subconscious! I guess I do tend towards orange/red. Good to recognise that! So that took up half the class with everyone showing their 3 books. The rest of the class was spent with Lorette giving advice on our storyboards. When it came to mine, she didn't have much to say, except she agreed about not including the lines which question the reader as they are repetitive and unnecessary. She did suggest a different perspective for the last illo - to pull out more as if you are walking away instead of closing in tight again, which I thought was a good idea. I also had a few thoughts of my own so i will post them once I have redone them. Overall I am enjoying the class but I find it is going a bit slow for me. I guess it's always hard with many students at different levels, but i want to be leaving the class with my head bursting with new information, and that's not happening yet. The next classes should be fun though, next week we're doing pen & ink techniques, then watercolour/acrylic, and then collage, which i think I am most looking forward to. Well if you made it this far without tuning out or going for another cup of coffee then I'm very surprised! !